Over the years there’s been plenty GameBoy-centric jams, and while I only managed to cover some of them, what came to be during these is definitely on the groovy side of things. Obviously few, if any, entries were made to run on the original hardware, but that’s not the point of such a jam. No, this is about mimicking the look/sound of Nintendo’s classic handheld, and soon we’ll have brand new examples of just that, courtesy of #GBJam2018! 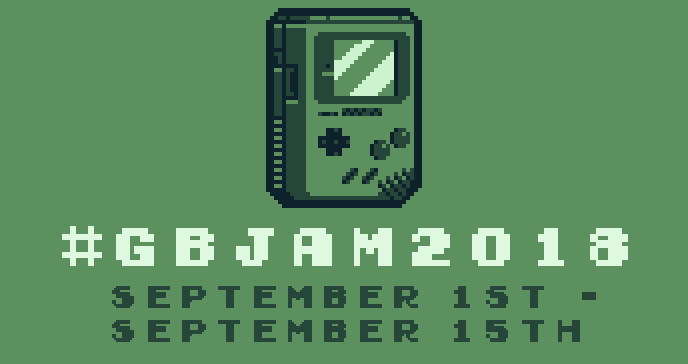 Now, as you can tell from the above ‘screenshot’, #GBJam2018 (or… Gameboy jam 2018?) will run its course from September 1st to the 15th that same month, following last year’s #UOGJam. Same host, same rules, only this time there’s an actual prize on the line: a “heat change GameBoy mug”! Intriguing. Not often we see game jams with prizes, much less non-digital ones such as this. While the rules are simple and listed right there on the website, I’m gonna highlight a few of the more important ones anyway: game resolution should be 160×144 with a 4-color limit, no asset recycling. That’s about it. Oh, and you’re encouraged to use GameBoy style sound/music, of course. In fact, please do, for a more authentic experience. Got all that? Great. Then… get to brainstorming, because September is right around the corner (not really)!